Baby (Lap, Throw) Sizes: 31 ½ (37 ¾, 49 ½)" [80 (96, 125.5) cm] wide x 36 ½ (49 ½, 58 ¼)" [92.5 (125.5, 148) cm] long. Texture, texture, texture. That’s what I love when knitting up a blanket to adorn a new baby or my living room couch. This blanket has texture galore with pretty embossed pendant shapes individually bordered by cabled arches – creating a stunning overall scalloped design. 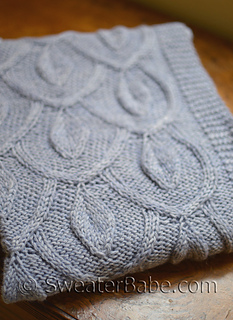 Strategically placed increases and decreases, a few cable crosses, and knit and purls are all it takes to knit up this gorgeousness. Charted and written out so you can follow your preference. 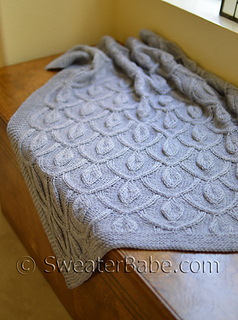 Knit-in Garter stitch borders add a neat finished edge all around and make this a one-piece project with only the loose ends to weave in at finishing. 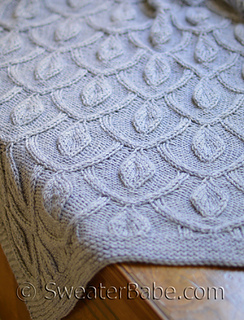 Blocking brings out the true beauty of this stitchwork and worsted-weight yarn makes it a medium weight blanket perfect for all seasons (and ideal for many yarn options). Pattern includes the baby blanket size, shown here, as well as a lap and throw size. ALSO AVAILABLE is an Addendum to convert the baby-sized blanket into a cool cardi: Hamachi Cardigan + Blanket See #218H Hamachi Cardigan Addendum. Errata fixed 8/1/18: p. 5, chart. Row 4, 3rd st from either end is a knit, i.e. 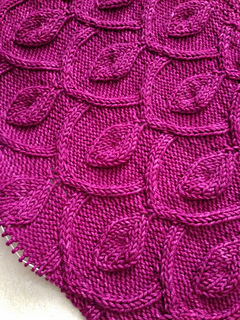 purl dot on the chart. Errata fixed 8/8/15: p.2 2/2 RC and 2/2 RPC cables begin with “sl 2 sts to cn,” not 1. New pdf uploaded, so any new purchases are fixed. Sorry!